Subtract Apple’s cut of 30% from this to arrive at the payout of 0.44 EUR. Add 15% VAT to 0.627 EUR for iTunes Sàrl in Luxembourg, who acts as the operating legal entity for Europe: 0.627 EUR * 115 % = 0.72 EUR. N.b. : This tax rate is valid for all European customers, regardless of the developer’s or the customer’s nationality. Look it up in European Council Directive 2002/38/EC and amending Directive 77/388/EEC. 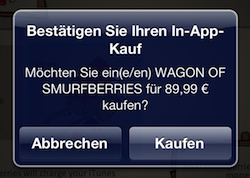 So, to get a nice price, Apple rounded 0.72 EUR to 0.79 EUR, giving them leeway to a USD exchange rate as low as 1.44 EUR. As to why the adjustment happend now – who knows what Apple’s rules for this look like. The Dollar dipped below 1.44 EUR a couple of times in the last four years. Round that up to nice-looking 0.89 EUR. To arrive at the new developer payout: 0.89 EUR / 1,15 * 70 % = 0.54 EUR. Across the 87 regular price tiers, the increase in retail price roughly is between 9% and 20%, accounting for some very irregular rounding at some tiers. Prepare yourselves for the next adjustment when the exchange rate stays below 1.15 for a while. How does this affect auto-renewing subscriptions? The basic rule is: If the developer racks up the price of a subscription, the subscriber will be notified when his renewal comes up and the subscription will not be renewed automatically. What happens when Apple increases the retail price? My guess would be that the customer will be billed the new price automatically. Guessed wrong. They cancel all subscriptions. Update: Decrementing the price tier to match (or possibly undercut(?)) the old Euro price will keep subscribers on their auto-renewing plan, but will reduce revenue outside of Euroland accordingly. Digital dead-tree publishers get special sauce for price tiers 1b (0,99 EUR) and 2b (1,99 EUR). As far as I can tell, these are only valid for Newsstand subscriptions, and stay the same after the adjustment, at the lovely exchange rate of 1 EUR = 1 USD. A recent addition to price tier 2b appears to be The Magazine.